Robin Williams is in talks to rejoin Ben Stiller and director Shawn Levy in Night at the Museum 3, the third installment of Fox’s action comedy franchise, reports THR. Williams is in negotiations to reprise his role as Teddy Roosevelt. 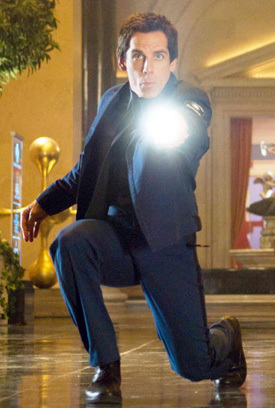 Ben Stiller is set to return as museum security guard Larry Daley with Shawn Levy returning to direct. Production on the fantasy adventure sequel will take place in Vancouver and London beginning February 2014. Plot details are being kept under wraps. Night at the Museum (2006) followed Larry Daley (Stiller) as he discovered, at night, the exhibits at New York’s Museum of Natural History come to life. Night at the Museum: Battle of the Smithsonian (2009) then brought the action to Washington, DC. Ben Stiller will reprise his role as museum security guard Larry Daley with Shawn Levy returning to direct Night at the Museum 3. Plot details are being kept under wraps. “Night at the Museum” (2006) followed Larry Daley (Stiller) as he discovered, at night, the exhibits at New York’s Museum of Natural History come to life. “Night at the Museum: Battle of the Smithsonian” (2009) then brought the action to Washington, DC.